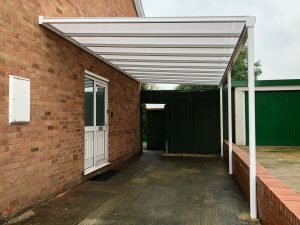 A recent installation, this polycarbonate carport installation shows another use for the increasingly popular Samson P16. The P16 is one of our most popular systems and it’s versatile nature and minimalist looks means it suits a variety of purpose and properties. 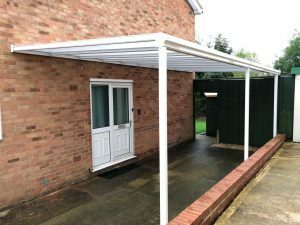 With a projection of 3.5 metres, and a length of up to six metres, this system is ideal for a carport, which it was used for in this particular case, to protect both the car and the area outside of the door of the home from adverse weather such as heavy rain, hail or even snow. Constructed entirely from aluminium, the P16 offers fantastic longevity and all the fixings are 316 marina grade stainless steel, designed for total corrosion resistance. The system was specifically designed to fit between the house and the small brick wall on the edge of the drive, and finished in a simple white colour to match the doors and windows of the house, this system looks completely natural as part of this home. The polycarbonate roof panels are available in clear or opal, and even contain a layer of UV protection, and the system comes with a full 10 year guarantee and a 25 year life expectancy, to give you total peace of mind.